Memory is a storage component in the Computer used to store application programs. The Memory Chip is divided into equal parts called as “CELLS”. Each Cell is uniquely identified by a binary number called as “ADDRESS”. 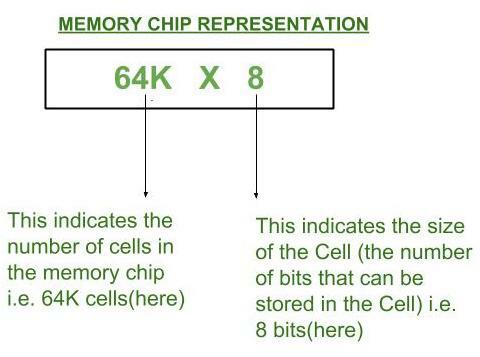 For example, the Memory Chip configuration is represented as ’64 K x 8′ as shown in the figure below. Now we can clearly state the difference between Byte Addressable Memory & Word Addressable Memory. When the data space in the cell = 8 bits then the corresponding address space is called as Byte Address. When the data space in the cell = word length of CPU then the corresponding address space is called as Word Address. Based on this data storage i.e. Bytewise storage, the memory chip configuration is named as Byte Addressable Memory. Based on this data storage i.e. Wordwise storage, the memory chip configuration is named as Word Addressable Memory. For eg. : 64K X 8 chip has 16 bit Address and cell size = 8 bits (1 Byte) which means that in this chip, data is stored byte by byte. For eg. : For a 16-bit CPU, 64K X 16 chip has 16 bit Address & cell size = 16 bits (Word Length of CPU) which means that in this chip, data is stored word by word. i) The most important point to be noted is that in case of either of Byte Address or Word Address, the address size can be any number of bits (depends on the number of cells in the chip) but the cell size differs in each case. ii)The default memory configuration in the Computer design is Byte Addressable . first_page What is the difference between echo, print, and print_r in PHP?